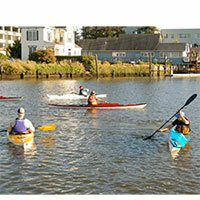 This class uses sit-inside kayaks only, as it is designed to familiarize paddlers with this specific type of craft. 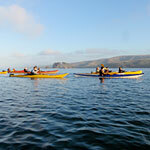 We are happy to offer a sit-on-top kayak class if there's enough interest. Response From Clavey Paddlesports: Yes - all equipment is provided in the intro class. Response From Clavey Paddlesports: Our minimum age for this class is 12. 7/15/2012 – I have kayaked before but never have any formal lessons. I'm interested in learning some basics but most concerned with knowing what to do if I capsize or other scenarios. Would you recommend the basic class or rescue? Response From Clavey Paddlesports: We would recommend Sea Kayaking I or a private class, as this focuses more on self-rescue. Response From Clavey Paddlesports: Our minimum age for the intro to kayaking class is 12, so unfortunately we cannot accommodate your kids. The same is true for our private lessons. However, the 8 and 10 year old can join us for a Petaluma Marsh tour, but they would need to be accompanied by an adult in one of our tandem kayaks.